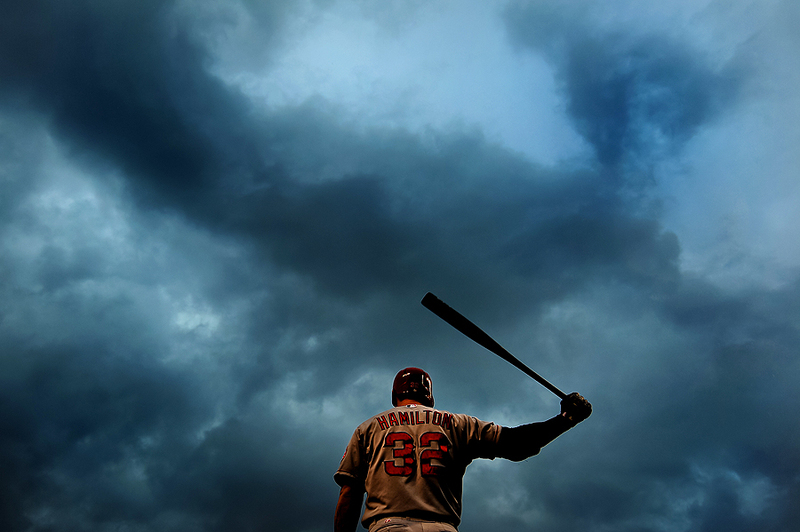 "Josh Hamilton #32 of the Los Angeles Angels of Anaheim stands on deck as storm clouds linger in the sky before playing the Baltimore Orioles at Oriole Park at Camden Yards on June 10, 2013 in Baltimore, Maryland." Weather has been playing a big part to my photographs this year - and a regular season game between the Los Angeles Angels of Anaheim and the Baltimore Orioles once again showed that. Severe storms scattered across the region a majority of the day and as first pitch was about to be thrown, the sky didn't look very friendly. Knowing very well the game could be delayed, or even worse, cancelled, I worked the stormy clouds to help tell the story of the game. Most of the game was played in heavy rain before the game would eventually be delayed for more than two hours. After the rain passed, play resumed under clear skies which allowed the Orioles to walk away with the first win in a three game series.